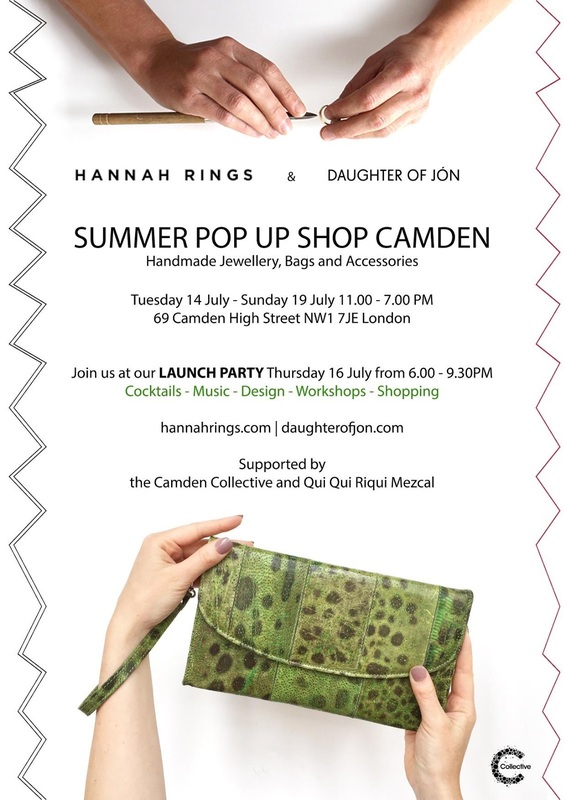 From Tuesday 14th - Sunday 19th July DAUGHTER OF JÓN and HannahRings will be opening a pop-up shop at 69 Camden High Street to sell their designs - bags, rings and other things. 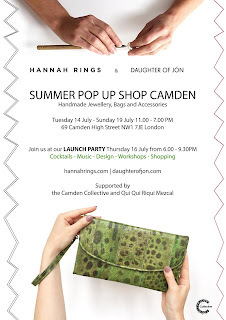 The launch party is on Thursday 16th, and there will be workshops running throughout the time the shop will be open. Go down and buy some of their things! "With the help of Pedro and Monkey pedroandmonkey.com, DAUGHTER OF JÓN and HannahRings we have created a little home away from home at the Camden Collective space on Camden High Street and we would love for you to come and visit. We’re going to be there sipping tea and running a few workshops from Tuesday 14 July to Sunday 19th July but if you can only pop by once YOU CAN'T MISS THE OPENING PARTY ON THURSDAY THE 16TH AT 6PM! The launch party will have a selection of cocktails and mezcal by QuiQuiRiQui (they are dangerously moreish), music, plus a fair bit of brilliant design."